Here, I introduce my calligraphy of the words which participants in my project,co=art,have told me. 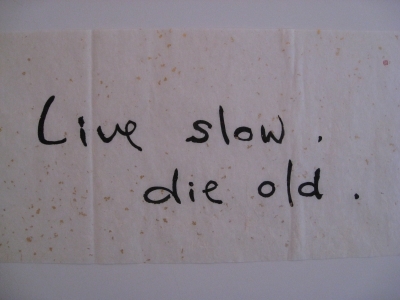 This , "Live slow , die old. ", is Ms.Julia Popescu's favorite words. It appears in a song "Take a ride" by Luscious Jackson. She is an ESL instructor. She lives in New York and is in her 30's. You can see my work more below. Copyright(c) 2011 Haruyasu Yanagi All rights reserved.